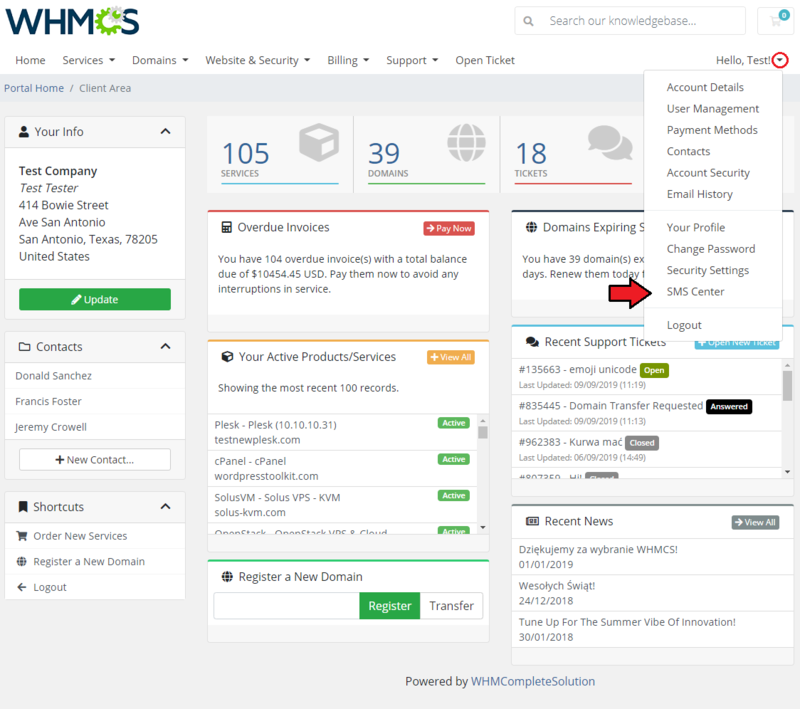 SMS Center For WHMCS is a module created to send text messages to your clients and administrators. You will be given the possibility to choose from over twenty different SMS gateways, define SMS templates in various languages and manage bulk text messaging. 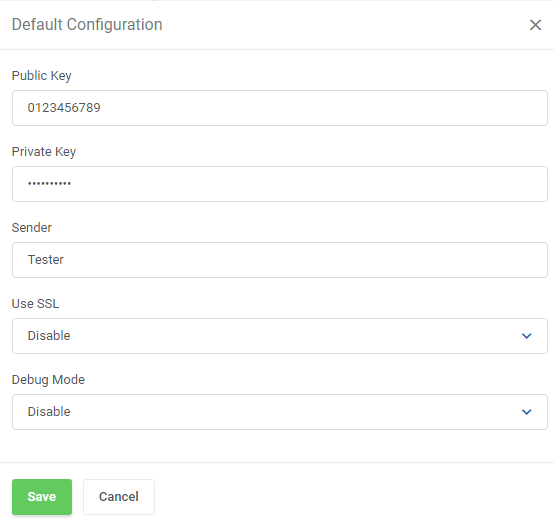 The module will also allow you to verify new clients and orders as well as enable SMS codes as part of two-factor authentication while logging in to your system. Finally, your customers will be enabled to decide whether they wish to receive certain notifications or not. ✔ Missing your favorite SMS Gateway? We will integrate it for free! 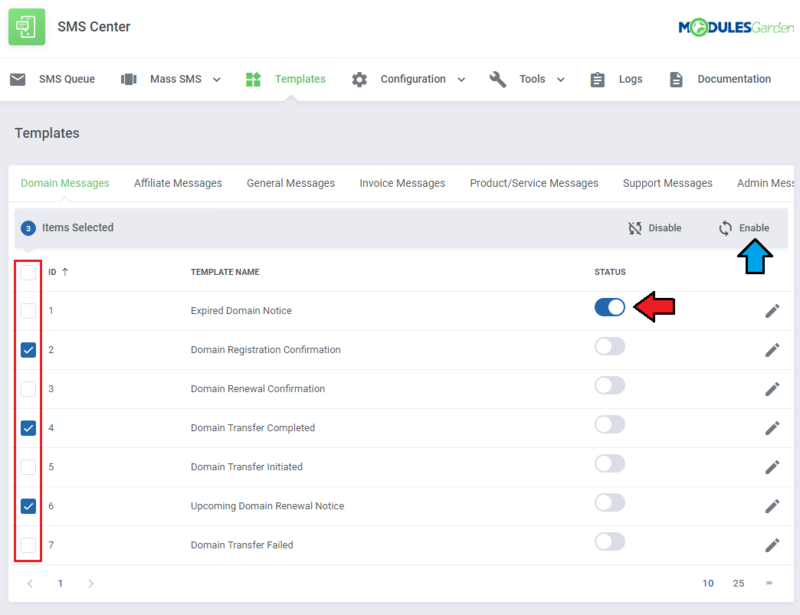 This tutorial will show you how to successfully install and configure SMS Center For WHMCS. 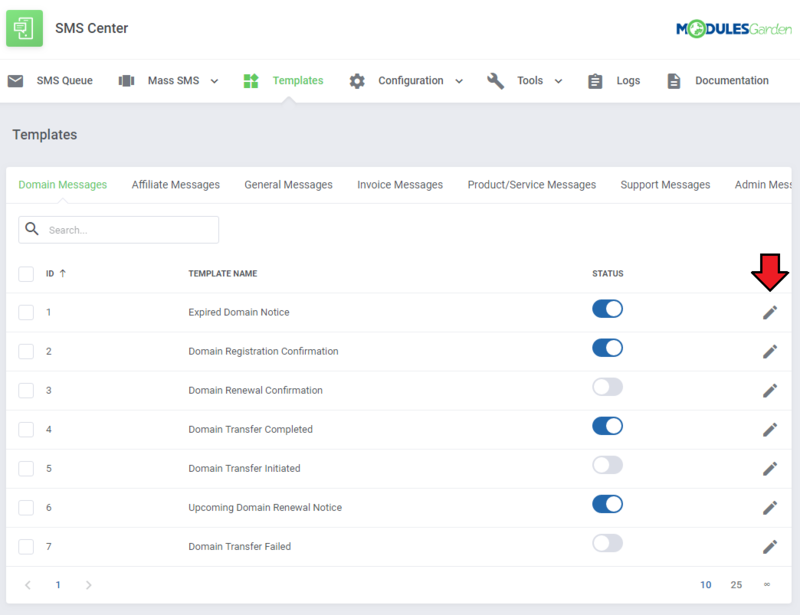 Note: If you are still using any versions of SMS Center For WHMCS prior to v3.x, read about it here. 4. 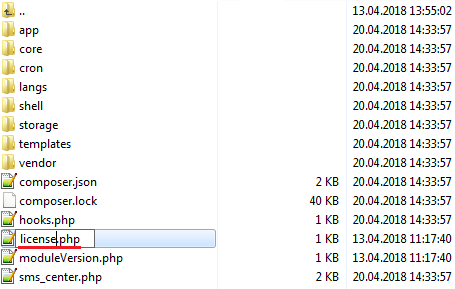 When you install SMS Center For WHMCS for the first time, you have to rename the 'license_RENAME.php' file. The file is located in 'modules/addons/sms_center/license_RENAME.php'. Rename it from 'license_RENAME.php' to 'license.php'. This folder is available at 'yourWHMCS/modules/addons/sms_center/' . 5. 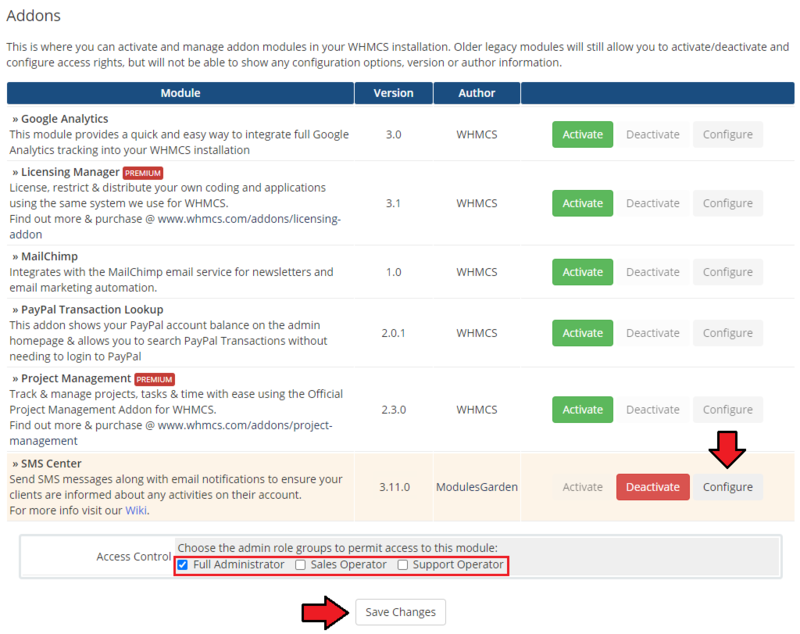 Now, you have to activate the module in your WHMCS system. Afterwards, find 'SMS Center' and press the 'Activate' button. 6. In the next step you need to permit access to this module. 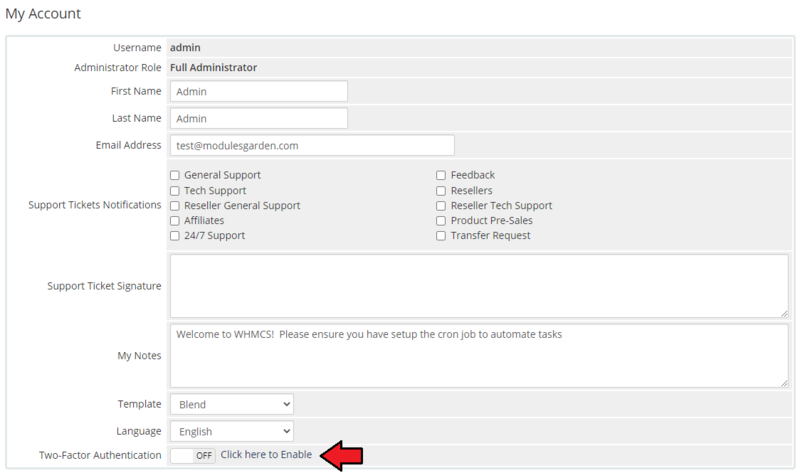 To do so, click on the 'Configure' button and select the admin roles which should have access to the module. 7. Finally, set up the cron command line provided below and define its frequency (10 minutes interval is suggested). This will allow the module to send text messages. Note: Once the cron is executed, it operates continuously. 8. 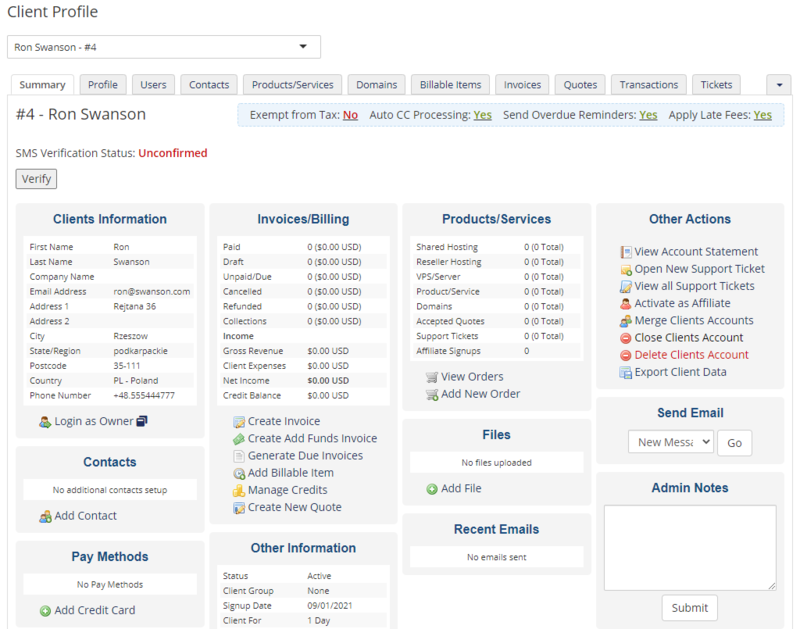 Congratulations, you have just successfully installed SMS Center For WHMCS! 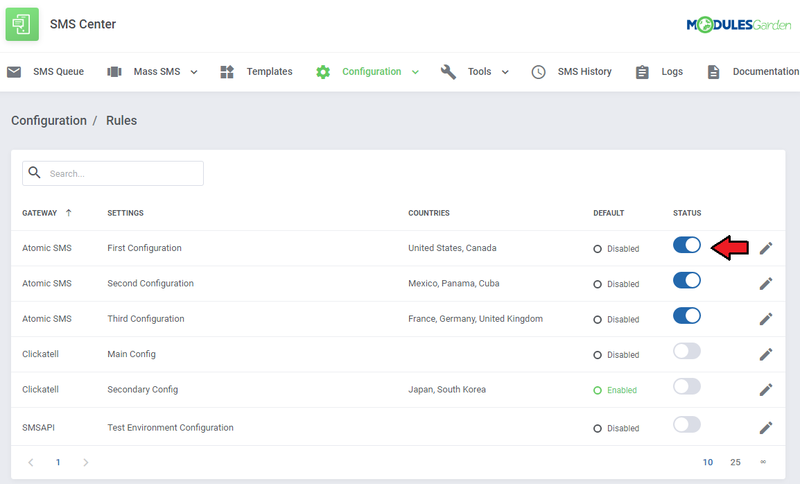 SMS Center For WHMCS is a module which allows you to send predefined text messages to your clients the same way emails are sent. Under 'Configuration' tab you will find 'General', 'SMS Gateways', 'Administrators' and 'Rules' sections. 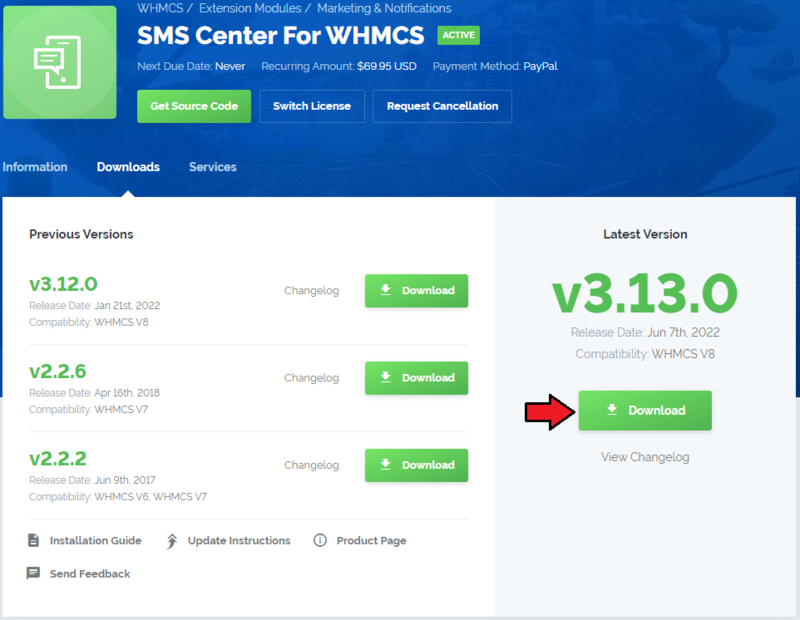 Configure each of them to allow full usage of SMS Center For WHMCS module. 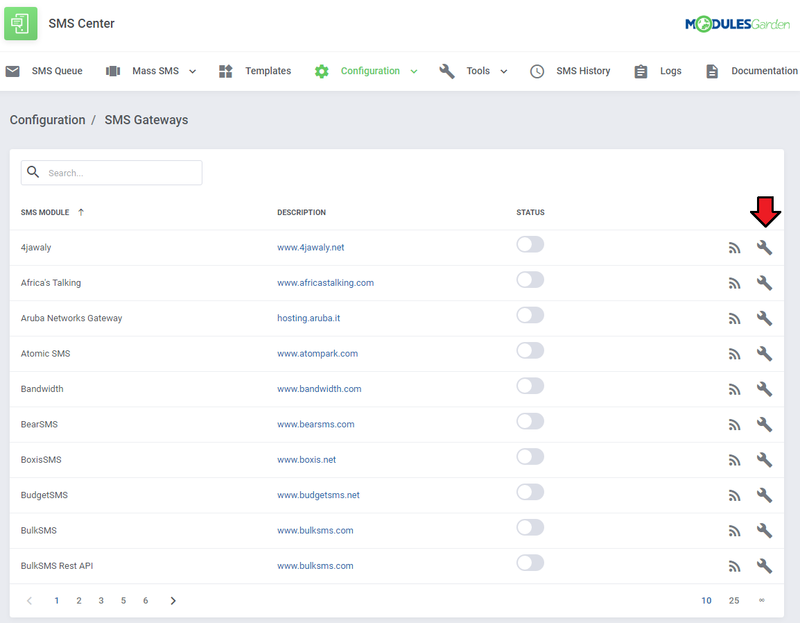 Press the first one 'SMS Gateways' to configure and check connection with SMS gateways. Here you will find all possible gateways that can be used in our module. Press 'Simple Configuration' next to a gateway you wish to use. Configuration of each gateway may vary depending on its requirements. Apart from connection details, you may here also enable debug mode to log API requests and responses. You can check whether configuration is correct through pressing 'Check Connection'. If connection is successful, you can proceed further. Press 'Enable' next to the gateway to activate it. Advanced gateway configuration allows you to use multiple credentials for the chosen gateway type. 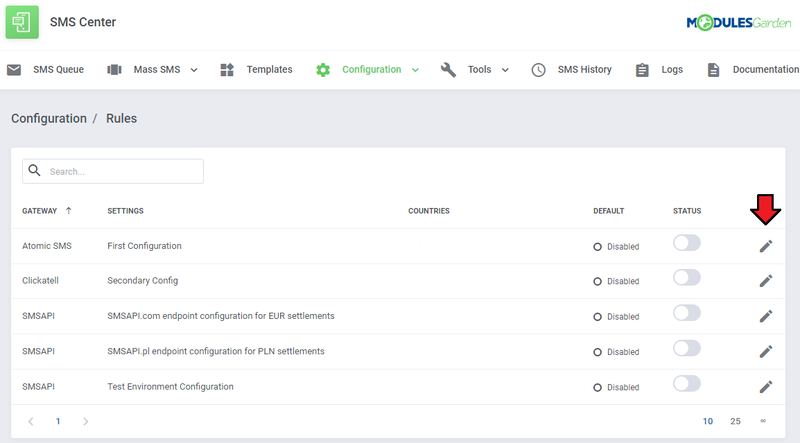 This feature can prove useful when you want to use a single gateway submodule with configurations from accounts dedicated to various countries. To start, to go to 'Configuration' → 'General', enable the 'Advanced Settings' option and save changes. 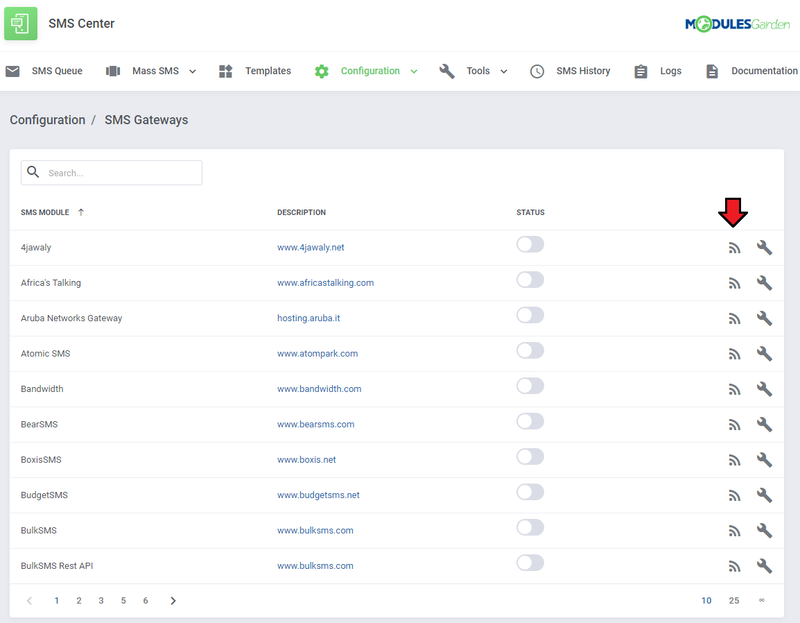 When you go back to the 'SMS Gateways' section, press the 'Advanced Configuration' button next to the chosen gateway and you will notice it has replaced the 'Simple Configuration'. Now you will be redirect to the new section, where you can add multiple configurations for a chosen gateway. Simply press the 'Add Settings' button to add a new configuration option. Next, add your gateway configuration in the same way as you would do during a simple configuration. Additionally, enter your 'Settings Name' to be able to distinguish this configuration from others afterward. Note: You can have as many configurations as you want. You will determine which configuration will be used in which case later on, in the rules section. 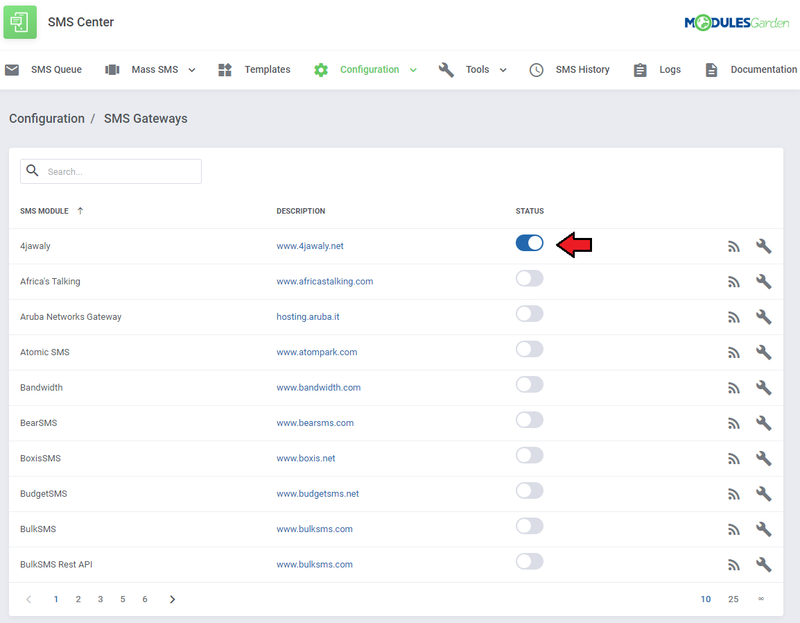 To check if your configurations have been saved properly, go back to the gateway list and press the 'Check Connection' button next to the gateway you had configured. 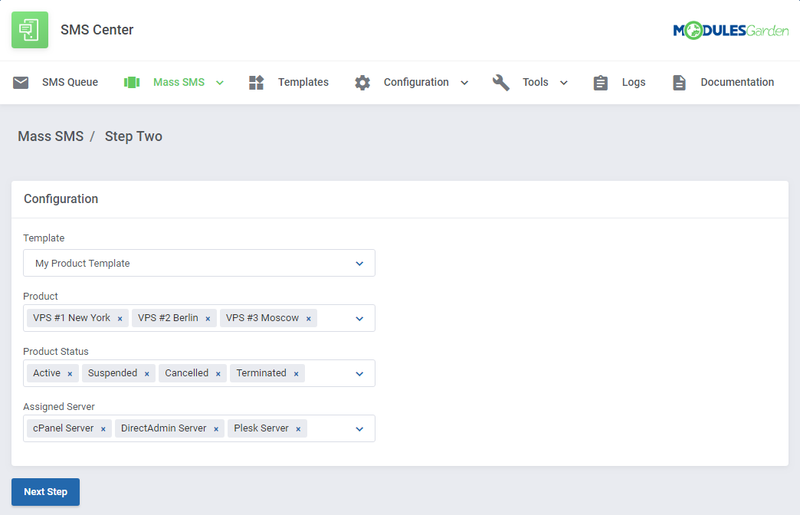 Then, in the newly opened window you will be able to select one of your saved configurations and perform a connection test. This section contains a list of all administrators. Here you can choose who exactly will receive particular SMS notifications. Follow the steps described below to configure staff notifications properly. Find the 'Administrator Notifications' section under the 'Configuration' menu. Next, press 'Edit' next to the chosen administrator. 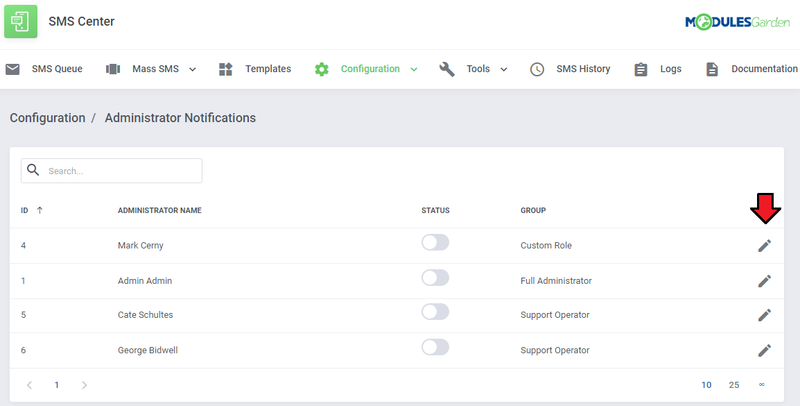 In order to enable SMS notifications for each administrator individually, firstly set configuration for every one of them. 1. Fill in the administrator's country code and phone number to which text messages with notifications will be sent. 2. Choose which of the available admin messages shall be sent to this particular administrator. 3. Choose addons, products and domains whose ordering will result in sending a notification to the specified administrator. 4. Select ticket priorities to send notifications to the administrator whenever a ticket with such priority is opened. 5. Decide if you want to receive clients login notifications (you can select these clients in the 'Tools' ' → 'Clients' section). Finally, enable all remaining notifications you wish to receive. Repeat these steps for every administrator you wish to receive individual admin notifications. The rules allow you to use different gateways (or their configurations) depending on the customer's country. You can find them under the 'Configuration' → 'Rules' menu. To add a rule, press 'Edit' next to the chosen gateway configuration. 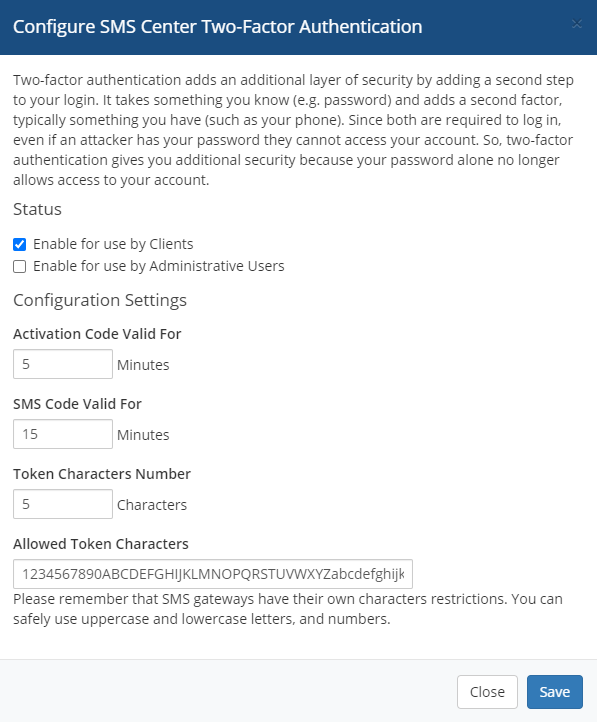 Note: Make sure that you have already your SMS gateways configured and enabled. Otherwise, the rules will not show up. Now select countries for which a particular gateway configuration will be used. The selected country may only be used for one rule. You can also mark the gateway as default, which means that it will also be used if no other rule concerning the customer's country is met. Note: Only one rule can be set as default. If you want the gateway to be used only when other rules are not met, set it as 'Default' and leave the 'Countries' field empty. Finally, toggle the status to enable your newly created rules. In the 'General' section you can find specific SMS configuration possibilities. Configure those you wish to activate and save changes when ready. By default, the 'SMS Center' section in the client area is disabled. You may enable it here. You can also toggle the advanced settings used for advanced gateway configuration. Choose a country code prefix that will be automatically added to the client's SMS number if it had not been specified. If you want to use a dedicated custom field for your client's SMS number, you can enable this feature here. Otherwise, the default phone number from the client's profile will be used for sending SMS notifications. Note: If you enable this feature, do not forget to select which custom fields from the 'Custom Fields' box you wish to use specifically. 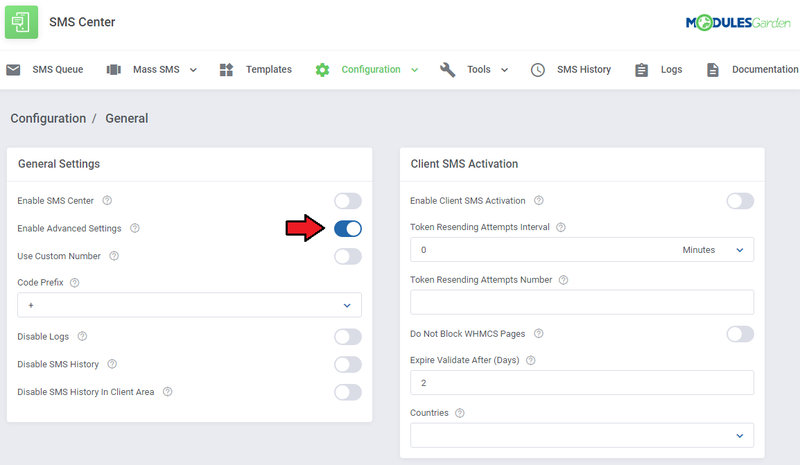 Enable 'Client SMS Activation' to grant each newly activated client a token which they will use to complete the activation process. Determine time intervals for sending tokens and maximum number of attempts to resend a token. When you enable the above option, the activation process of a new client proceeds in a slightly different way. Start with filling out your client's details. 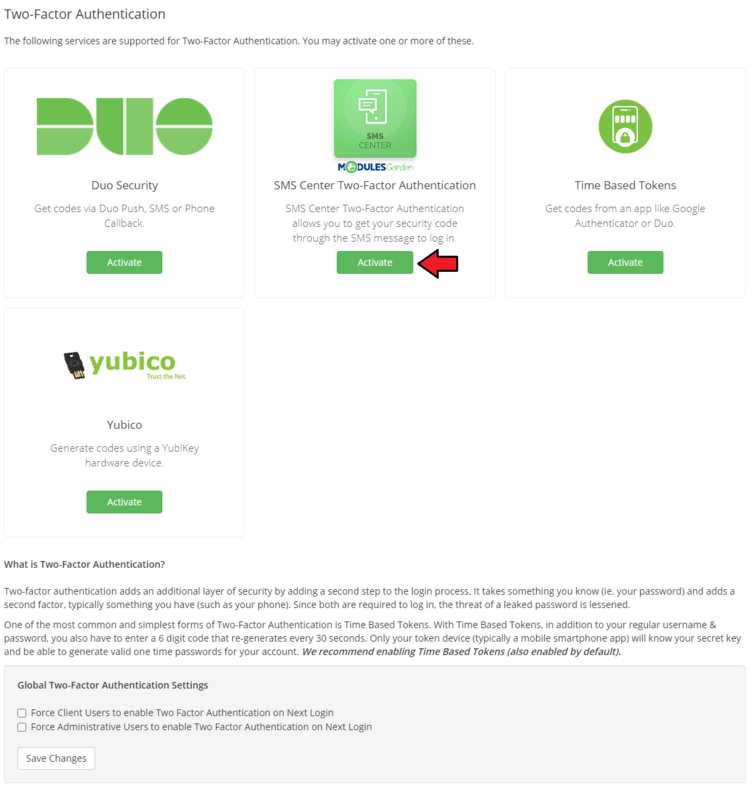 You can also accept the SMS agreements, but it is not required to receive the account activation token through SMS. When registered, the client's verification status will be 'Unconfirmed'. 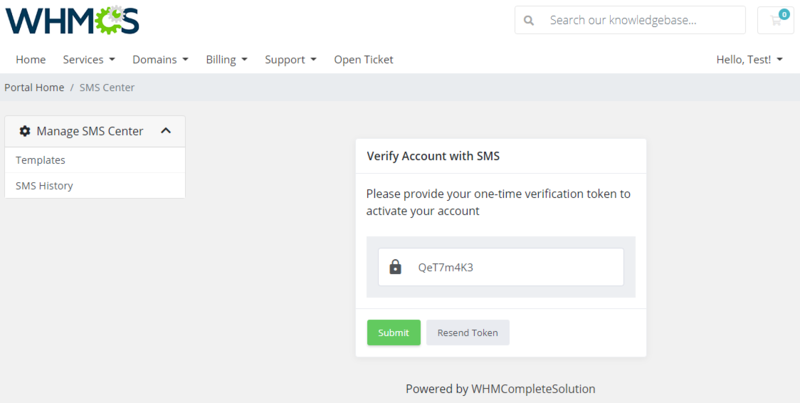 To verify activation after registration, the new client will have to type in a token received via SMS. If the administrator enables such possibility, the client may request sending the token again by pressing the 'Resend Token' button. 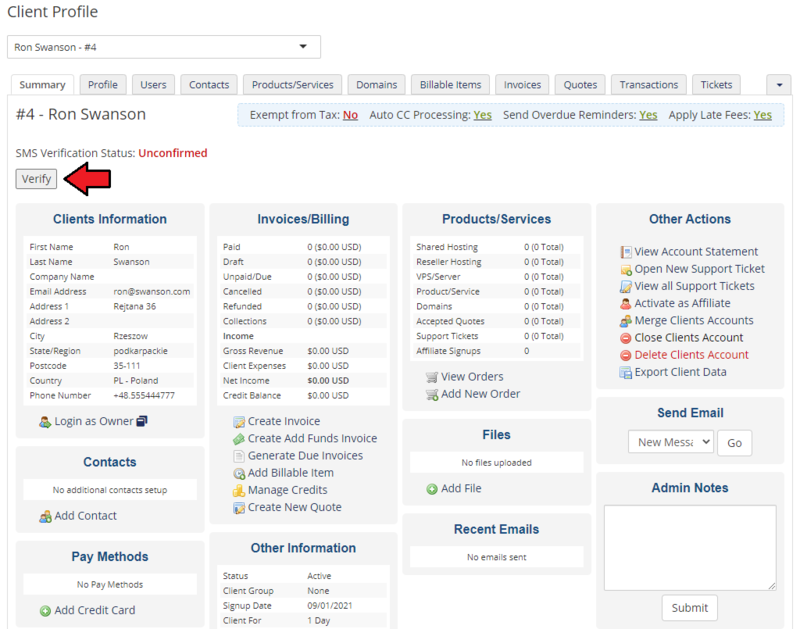 As an administrator you can also verify the client's account manually. After successful verification, the client's status will change to 'Confirmed'. Please be advised that whenever the client changes their phone number, their status will change back to 'Unconfirmed' and the verification process will have to be repeated. 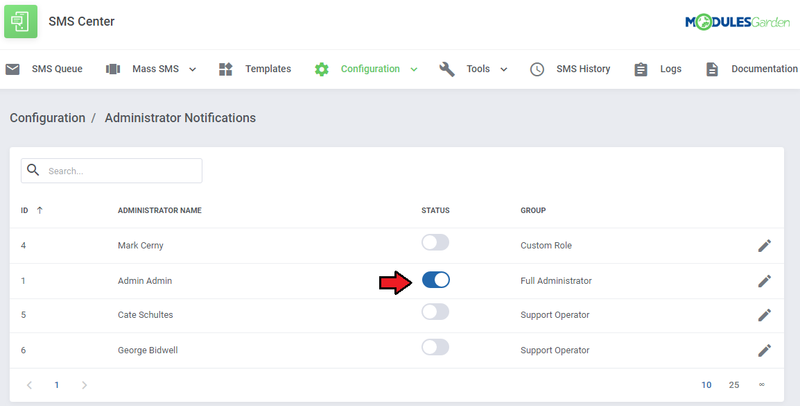 Enable 'Order SMS Activation' to allow activating orders which have been placed. Once an order is placed, a client will receive a text message with a token, which must be then used to complete the order. Here you can also define how many times within one hour a client will be allowed to ask for a token to be sent again. Note: This option does not support order upgrades! If the above option is enabled, a client will have to enter a valid token received via SMS in order to complete the placed order. Depending on the settings, you may allow clients to ask for resending the token. If such option is enabled, your client will simply need to press the 'Resend Token' button and they will receive another text message. If the provided token is correct, the order's verification status will change to 'Confirmed'. Enable this option to allow queuing of text messages. Note that this will not cover tokens sent for activations. 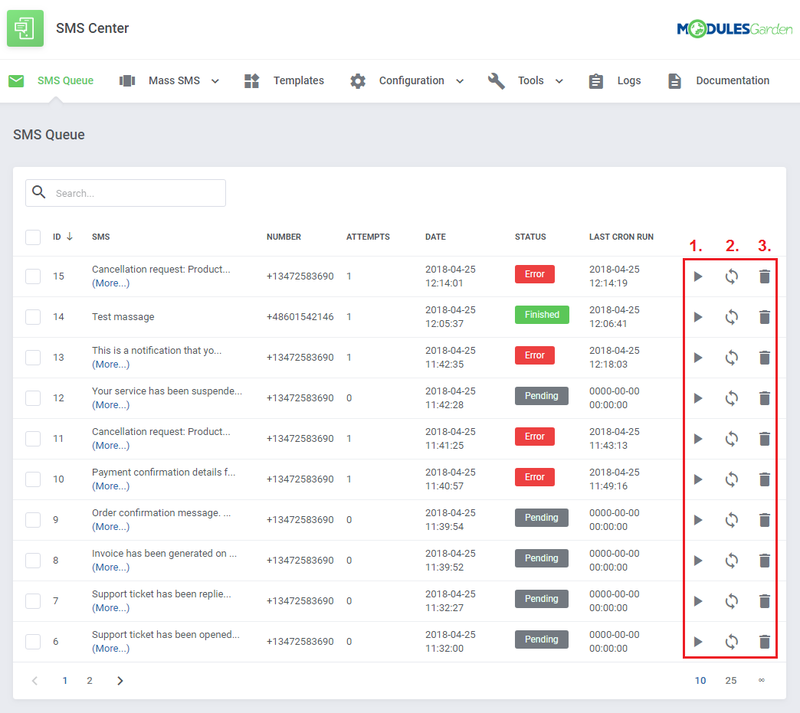 Determine time intervals between next resending attempts and the total number of messages that can be sent in one attempt. Finally, choose the time period when text messages will be sent to clients. 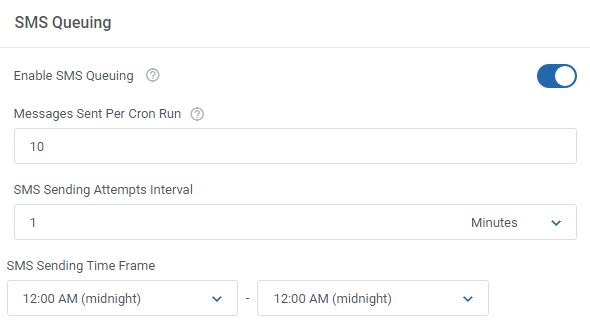 Note: Time intervals are based on your current WHMCS server time. Detailed information on this function is provided here. In this section you can also change default token settings by providing your own token length as well as allowed character sets. Any other special characters like: ", &, >, < or similar may cause unpredictable errors. 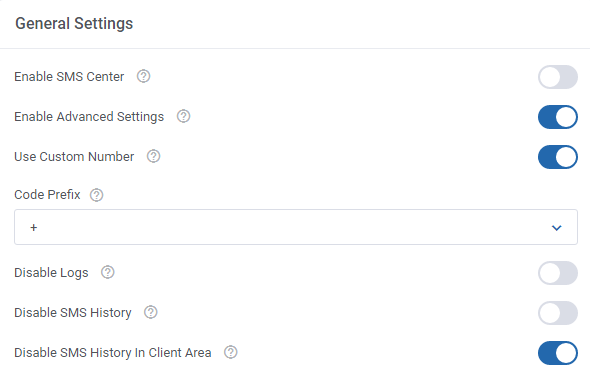 Finally, select which of the existing client custom fields should be used to provide the client phone number to send messages. 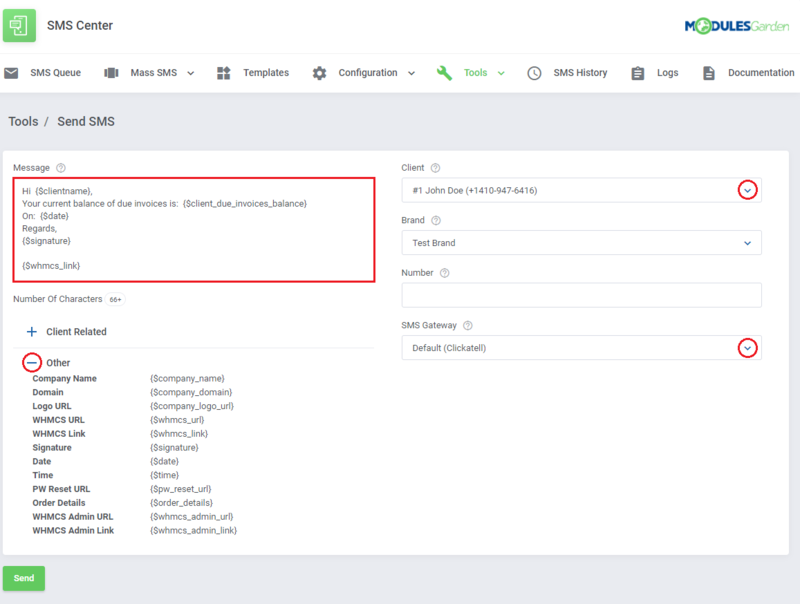 Note: Choose only if you had enabled the 'Use Custom Number' from the 'General Settings', because otherwise the default WHMCS number will be used and any additional custom fields will not be required. The 'Templates' tab contains the list of message templates. Each email template in your system has its text message counterpart. Any of these messages can be enabled/disabled by the 'Status' toggle or using the mass actions feature. 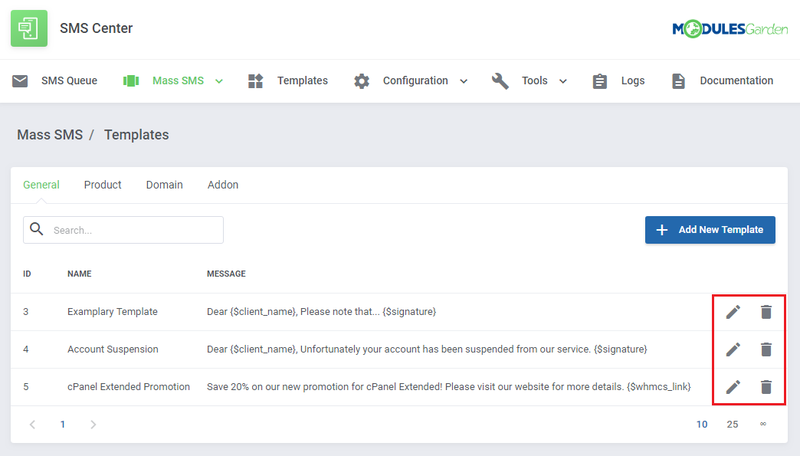 Every enabled template in admin area will then be also visible in the client area, where your clients can decide whether or not they want to receive chosen SMS notifications. 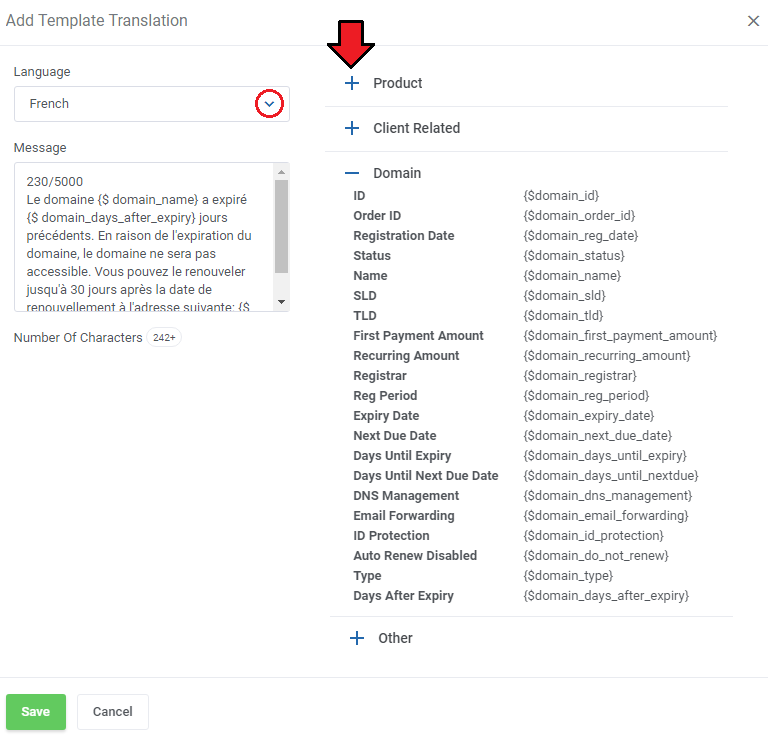 Note: Titles of the message templates can be translated in the module language file. By default, the module comes with simplified message templates, but you can edit each of them. First, choose the message category from the tabs above, and then press 'Edit' next to the chosen template. Note: Custom templates include no content, please add the custom template message by yourself. The first record on the list is a default message of the template. Our module allows you to define messages in selected languages. In order to prepare a message in an additional language, press 'Add New Template Language' as shown on the following screen. As you can see on the screen below, a new window appeared. Select the desired language from the dropdown menu and add your translated massage. Module template supports merge fields which can be easily inserted into messages. Simply click on the desired merge field and it will be added into the currently edited version of the message. Below the message field, there is a characters counter which helps to estimate the message length. The fixed message characters are counted, if there is a variable used, then the counter estimates the length and displays e.g. "104+". Note: Language of a sent message is based on the client's language. If you do not define a message in your client's language, the default message will be sent instead. In this section you will find a list of all text messages waiting for a cron run to be sent. Specific details on messages that can be sent in one attempt are specified in the 'General' section. If SMS queues are enabled, every single message (except activation tokens) is placed on this list before being sent. With every cron run a previously set up number of messages is sent. If message sending fails (because the number is incorrect, there are problems with gate, no funds etc. ), such SMS remains on the list until the next attempt. After three failed attempts its status is changed to 'Aborted'. 1. Start - send message manually. 2. Refresh - use when status has changed to 'Aborted' to bring it back to the queue. 3. Delete - remove message form the list. To save time, you can also use mass actions. Sending mass text messages to your clients is a convenient tool that allows preparing messages that will be delivered to a group of clients according to a specified configuration. Firstly, move to 'Mass SMS' → 'Templates', and create templates for mass messages there. To start with, choose a group to which the template will be connected and then press 'Add New Template' . Enter your template name and type in the message content. Use merge fields available for the group. Follow characters counter current rate to estimate the message length. Do not forget to confirm changes. All created templates are free to edit or remove when no longer used. 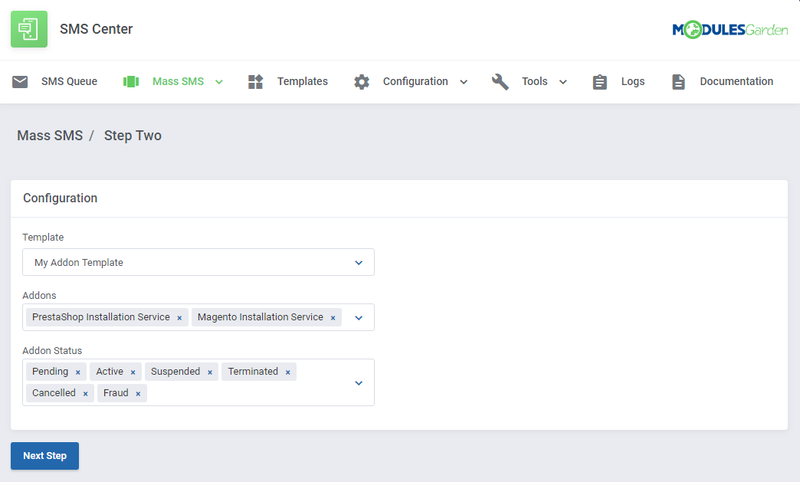 Now that you have created the templates, move to 'Mass SMS Configuration' to configure the recipient group. Start by adding new settings. filtering according to 'Addons', 'Domains' or 'Products'. 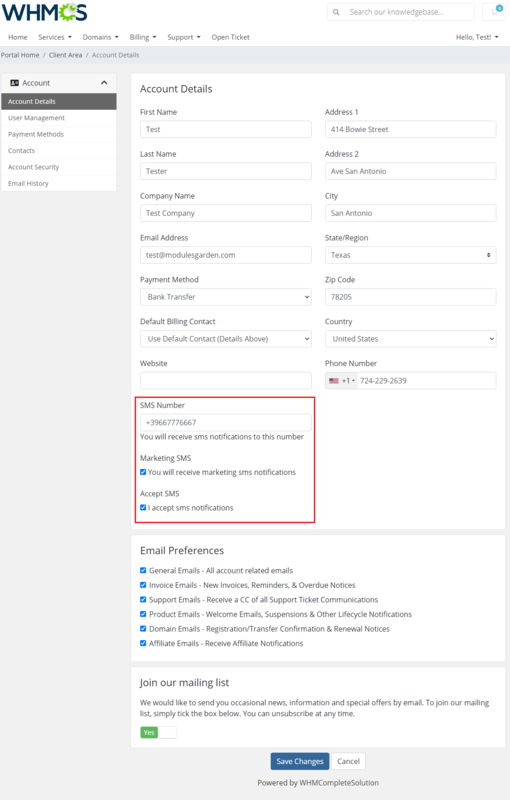 'Marketing SMS' is a default addon custom field. If you enable it, the message will be sent only to customers who have given their agreement for SMS marketing. All above sections are available for 'General' client filter. In the next step you will see how the final SMS will look like and preview the list of clients will receive the message (based on the previously selected filters). If you want to save this filter for later use, click 'Save Filters' . Surely, you may edit here the list. Add/remove clients from the list to keep it up to date. If everything is correct, press 'Send' to start sending messages to the clients. In the 'Tools' → 'Send SMS' you can send your custom SMS directly to any client or phone number using any of your gateways. 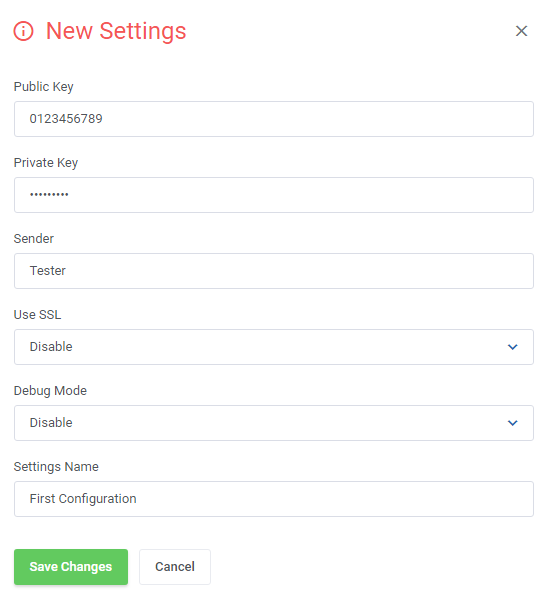 Simply type in your message, choose the client's default phone or SMS number from the list and choose which of your gateway configurations you want to use to send this message. Instead of selecting a client's number, you can also enter any number you want. In such case remember to leave the 'Client' field empty and provide a custom number in the field below. When the message is ready, press the 'Send' button which will add it to the 'SMS Queue' . In the 'Tools' → 'Clients' you can find list of all your WHMCS clients with their current SMS verification status. 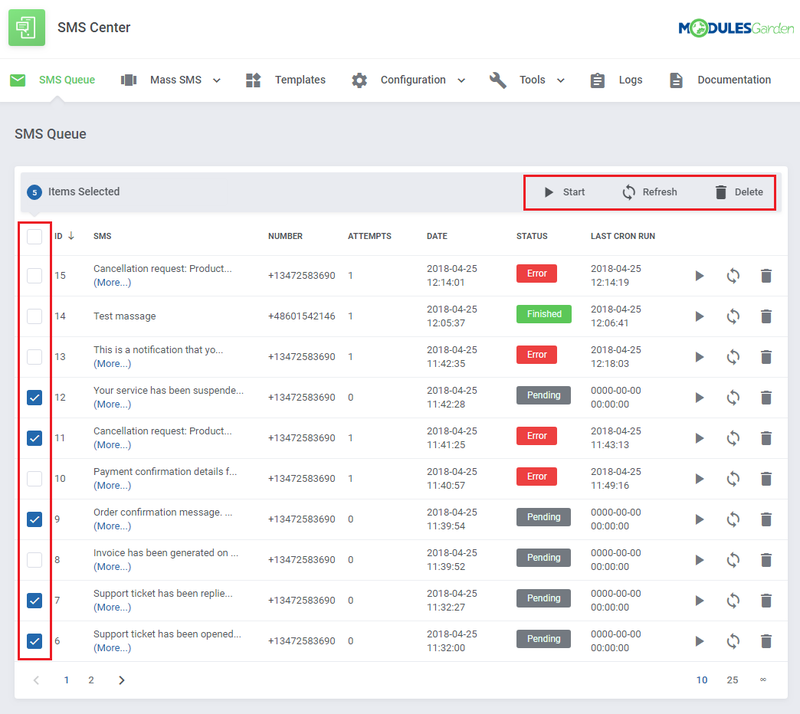 From here you can easily manage the verification status as well as toggle SMS notifications for administrators to receive when a specified customer logs in to the client area. 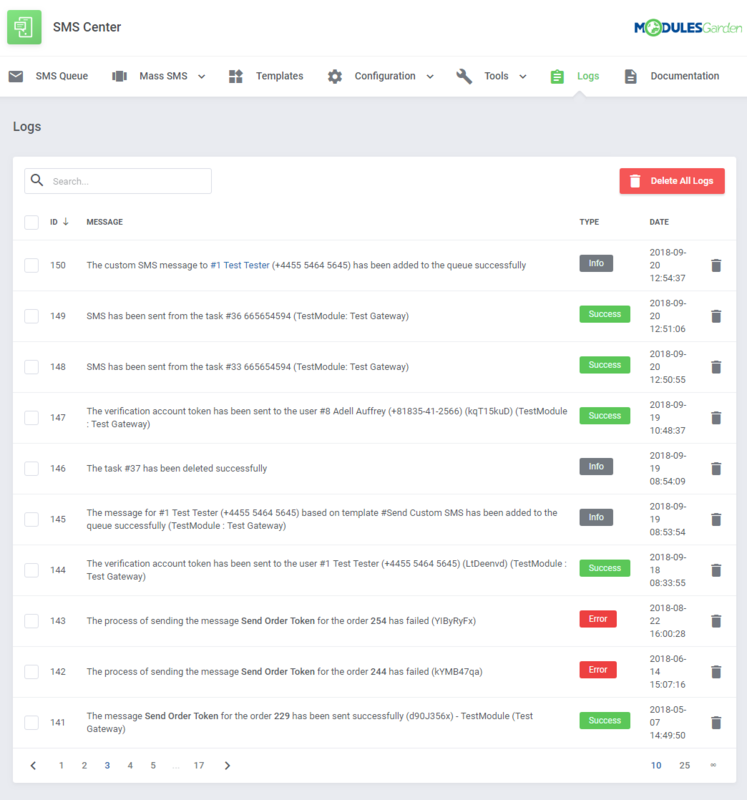 Messages sent to your clients are logged under the 'Logs' tab. 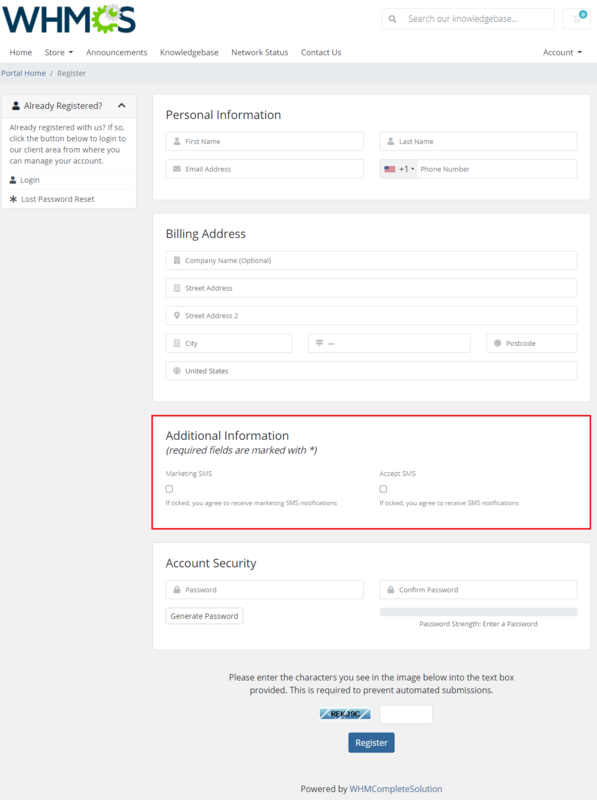 As you can see on the following screen, here you can find detailed information on each message sent automatically to a client notifying about certain actions. From the clients' summary page you can send text messages to clients using only a simple box. Type in the message content into the text field like on the screen below and press 'Send'. To meet the GDPR requirements, the client can decide to opt-in/out from receiving SMS message notifications and marketing massages during registration process. Note: You can edit the description of these rules in your 'WHMCS' → 'Setup' → 'Custom Client Fields' section. After registration, the options can later be changed in the client's profile. Important: The 'Accept SMS' field will be enabled by default for the already existing clients when you install the module for the first time. If enabled in general settings, a new position will appear in the client area navigation menu. 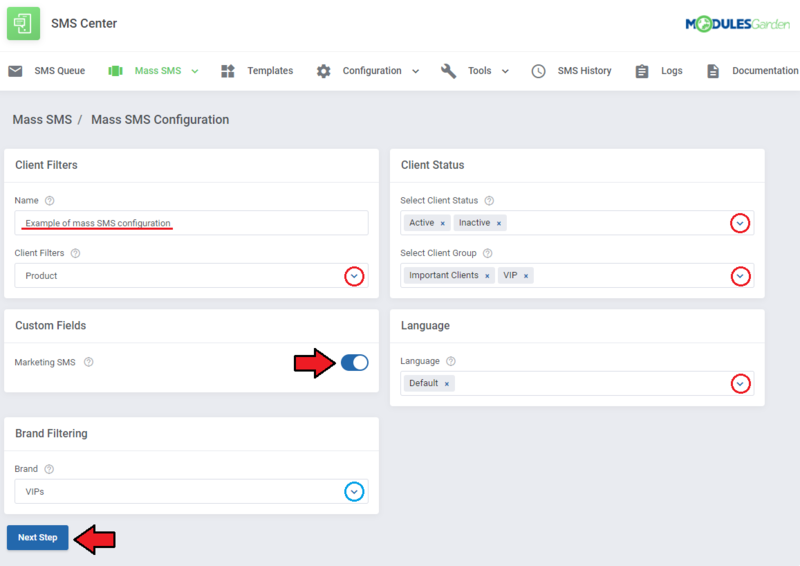 Through pressing it, your client will be moved to configuration of SMS notification. In this place your client can choose which notifications to receive. 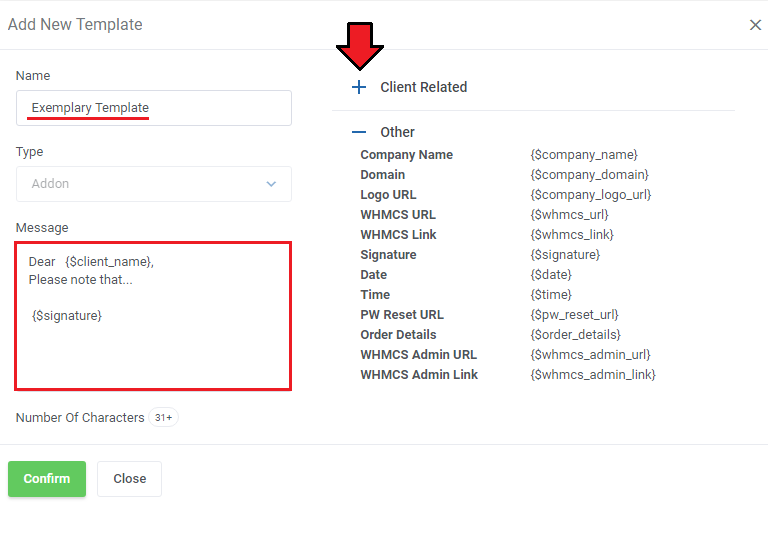 Remember that only templates with the status enabled set in templates configuration will be visible to the clients. Note: If you are using a custom number field to store clients SMS numbers, make sure they are provided in their profiles. Otherwise, SMS notifications will be unavailable for that clients. 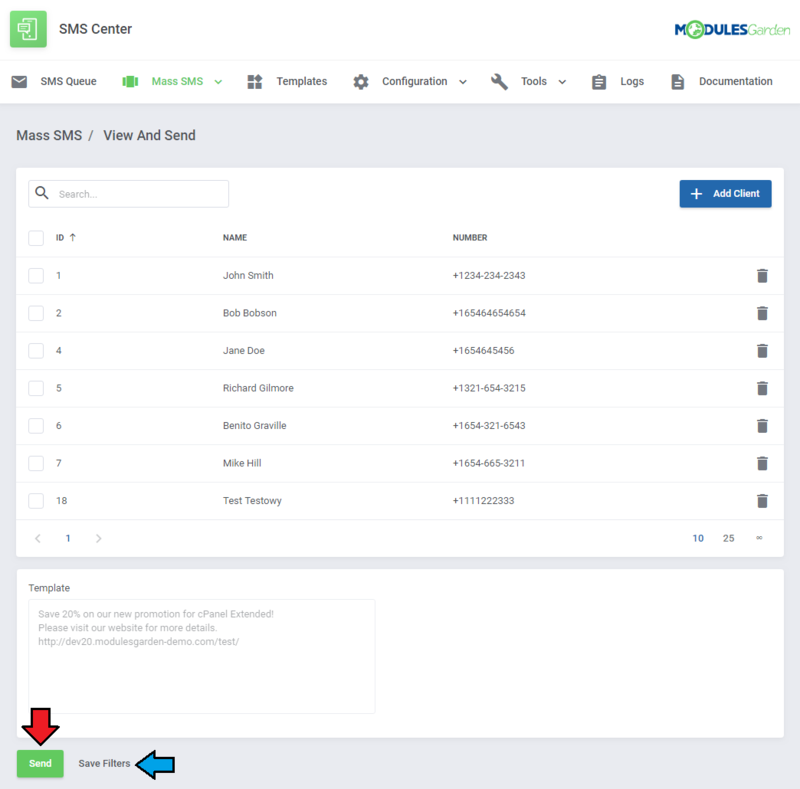 SMS center For WHMCS consists of two parts: the actual SMS Center addon and the authentication addon. 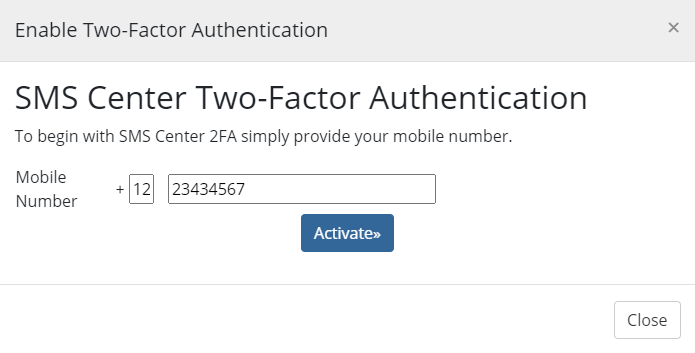 Two-Factor Authentication adds an extra layer of protection while logging in. 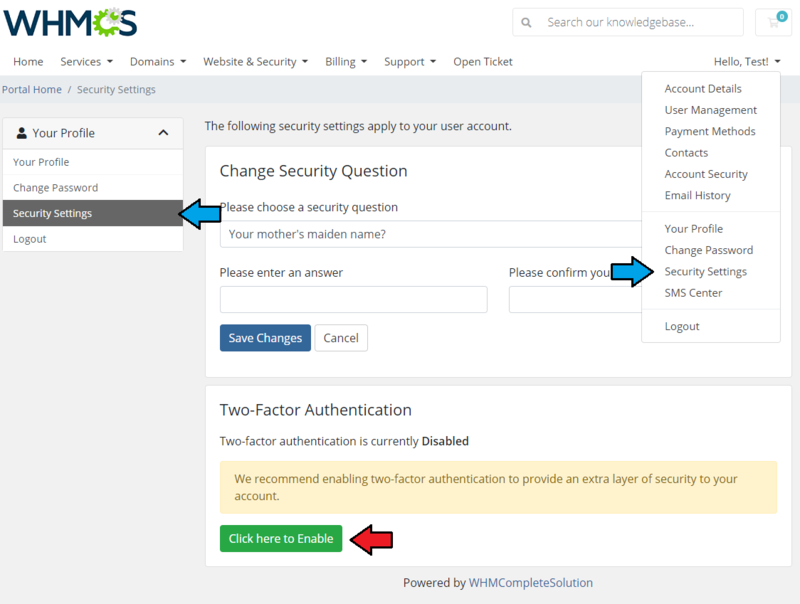 Once enabled and configured, each time your client signs in, they will be asked to enter both username and password as well as the second factor like a security code. In order to activate it, proceed to 'Setup' → 'Staff Management' → 'Two-Factor Authentication'. Afterwards, find 'SMS Center Two-Factor Authentication,' and press the 'Activate' button. In the next step you need to configure the addon settings. Enable for Clients - choose this option if you wish all clients to authenticate while logging in to their account. Enable for Staff - choose this option if you wish all administrators to authenticate while logging in to their account. Activation Code Valid For - decide how long (in minutes) a received code shall be valid. Used once before the first log in. SMS Code Valid For - decide how long (in minutes) a received via SMS code shall be valid. Used every time to log in after the first authentication. Code Length - specify how many characters will a code require. 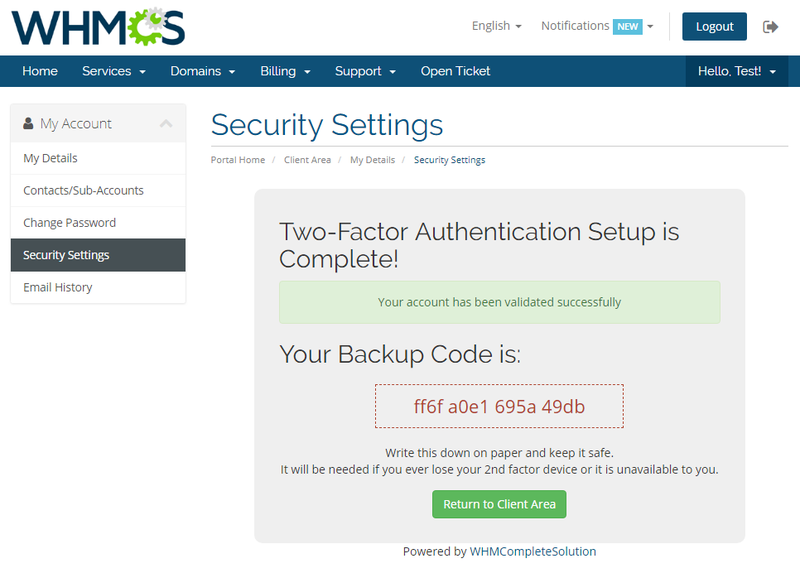 If you have activated the 'SMS Two-Factor Authentication' addon, your clients will be allowed to decide if they wish to use such security option. 1. Log in to your client area, proceed to 'Account Details' → 'Security Settings'. 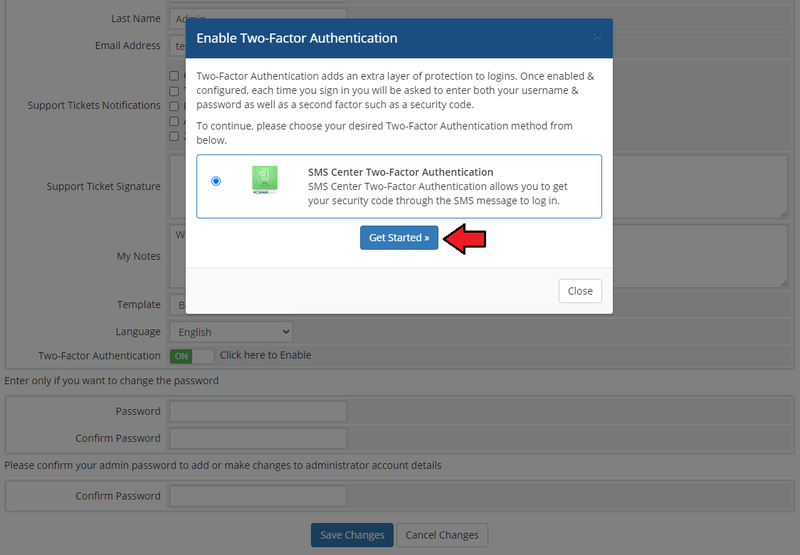 There is a button which enables two factors authentication configuration for the client. 2. Press the 'Get Started' button to proceed with the process. Note: This step will be skipped if the client entered a valid SMS number in the profile before. 4. A client should receive now an authentication code via SMS. Type in the code in the field and press 'Activate'. Note: Remember that the code is valid only temporarily, according to the addon settings! 5. 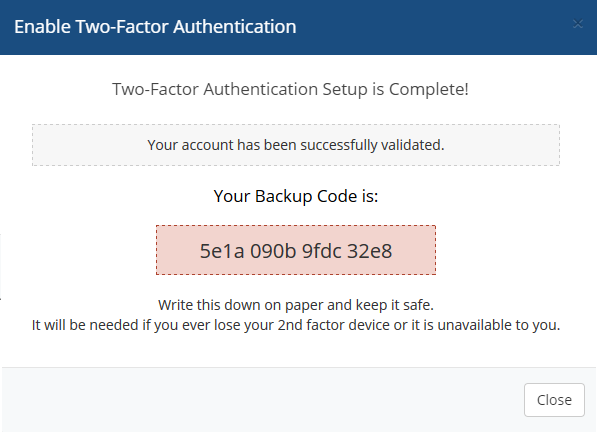 Two-Factor Authentication is now complete. Important: Remember to note and keep your backup code in a secure place! 6. The second factor will now be required in the next log in attempt. Wait for the SMS with verification code and enter it in the appropriate field. Press 'Login'. If you have any problems with receiving/entering the verification code, you can use your backup code. Important: In such situation remember to note and keep your new backup code in a secure place! 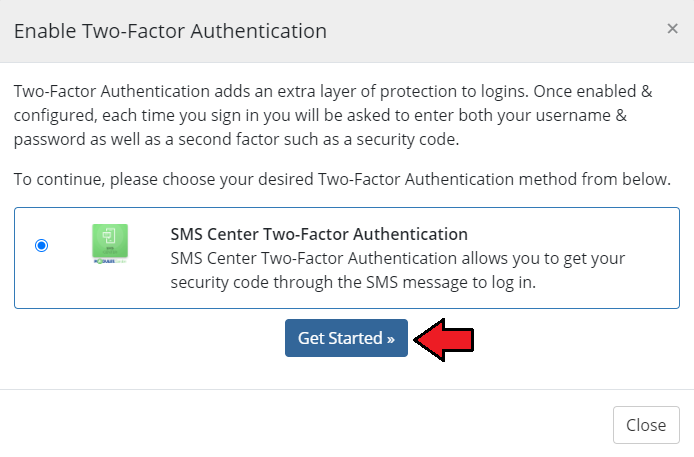 If the 'SMS Two-Factor Authentication' addon has been activated and enabled for staff, you will be able to decide as administrator if you wish to use such security option. 1. Proceed to 'My Account.' 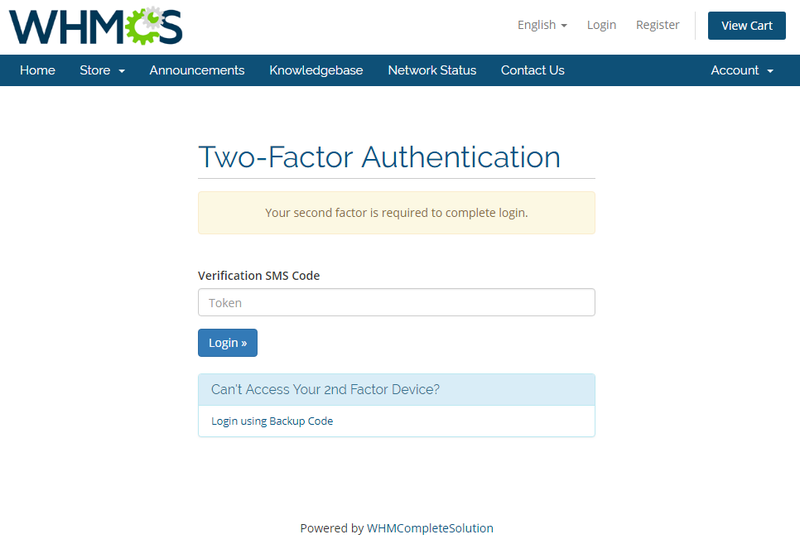 Find 'Two-Factor Authentication' and enable it to start the Two-Factor Authentication process. 3. You will receive now an authentication code via SMS. Remember that the code is valid only temporarily, according to the addon settings! 4. If entered code is correct, you will see a proper information. There will also be a backup code which must be copied and saved securely to log in with in case of some issues. Remember to note and keep your new backup code in a secure place! 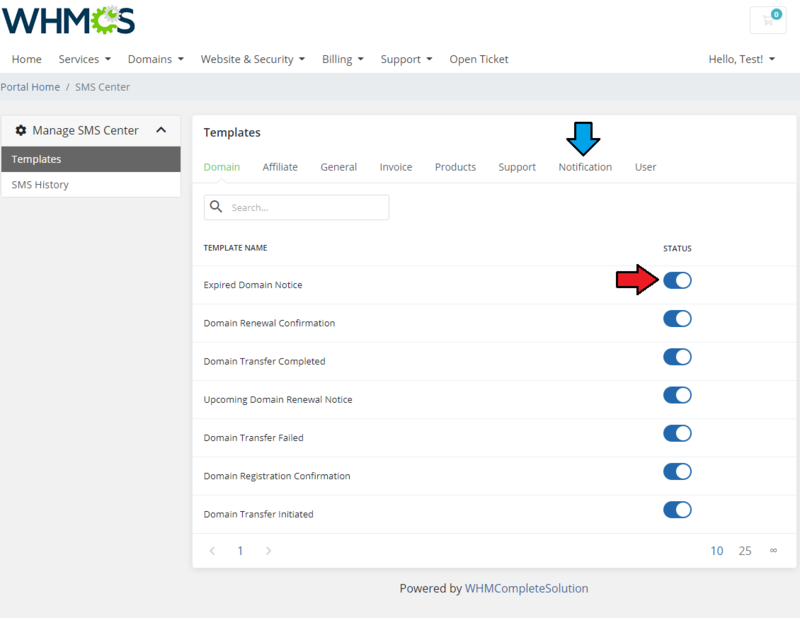 Below you can find a short instruction on how to integrate your SMS Center For WHMCS with the WHMCS API. In case you add phonenumber in the message, you have to specify whether it is an admin's number by entering: 'admin' => 1, just like in the example above. You do not need to add the above parameter for a user's number. 6. 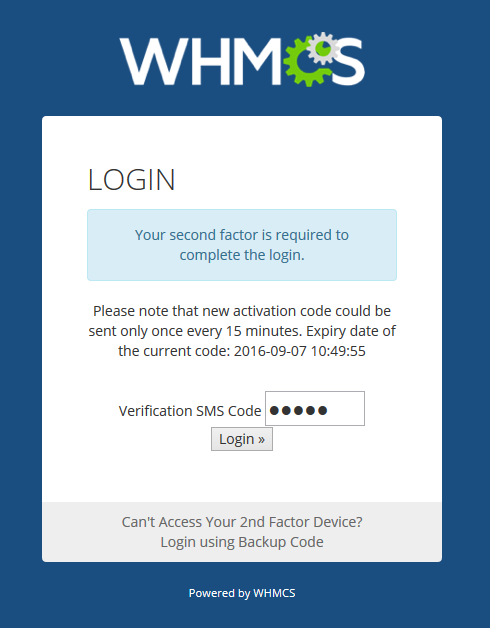 SMS Center For WHMCS does also support 'force' parameter. If set to 'true' , it allows to skip the queue for sending SMS messages and proceed with the task immediately. 1. 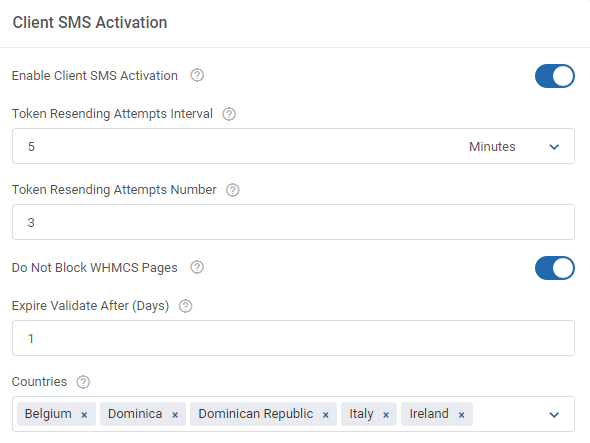 SMS Center For WHMCS has been integrated with our Client Profile Viewer For WHMCS module enabling you to send messages to your clients in a faster and even more convenient way. Messages sent automatically to clients after occurrence of specified actions (activity is logged in the addon's 'Logs' tab). Messages sent automatically to administrators after occurrence of specified actions (activity is logged in WHMCS 'Module Log' ). 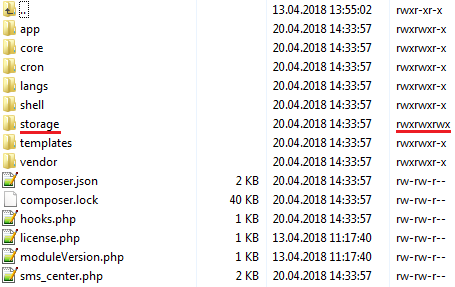 Messages sent manually from client's profile (activity is logged in WHMCS 'Module Log' ). 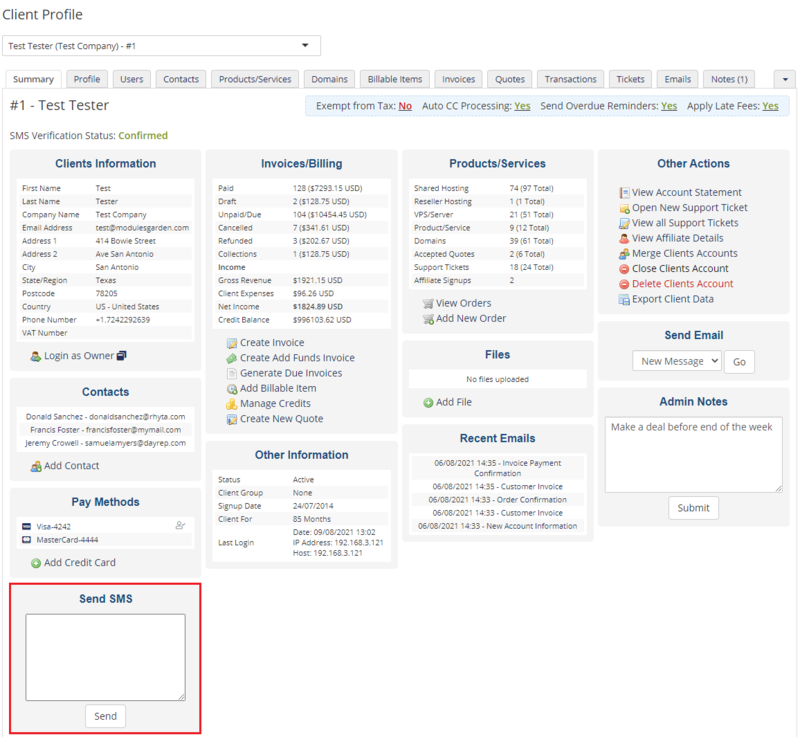 Messages sent manually from Client Profile Viewer For WHMCS widget (activity is logged in WHMCS 'Module Log' ). 1. 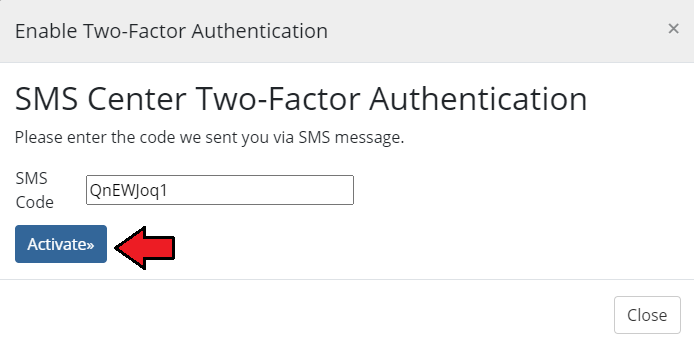 You may customize the text of 'Two-Factor Authentication' verification message delivered to a user. $invoice_domains_registered special merge field that shows only the domain name. Important: When updating the module from version 2.x to 3.x, you need to start the migration process to move settings from the previous version to the new one. 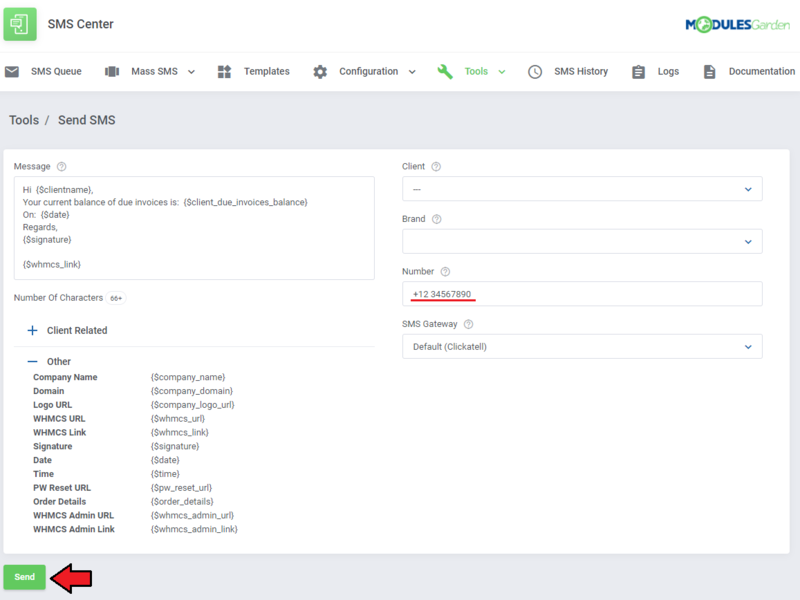 To do this, first update your module files to the newest version and set recursively writable permissions for storage directory in 'yourWHMCS/modules/addons/sms_center/' location. 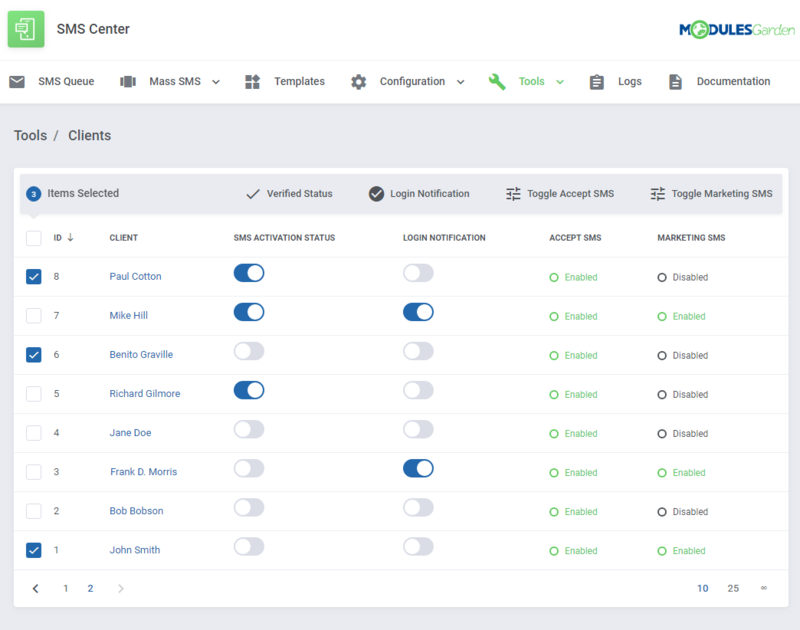 The migration process covers: the configuration of SMS gateways, general settings, chosen template notifications by clients, administrators' phone numbers, SMS queues, SMS templates and Mass SMS templates. Any other settings might not be migrated! 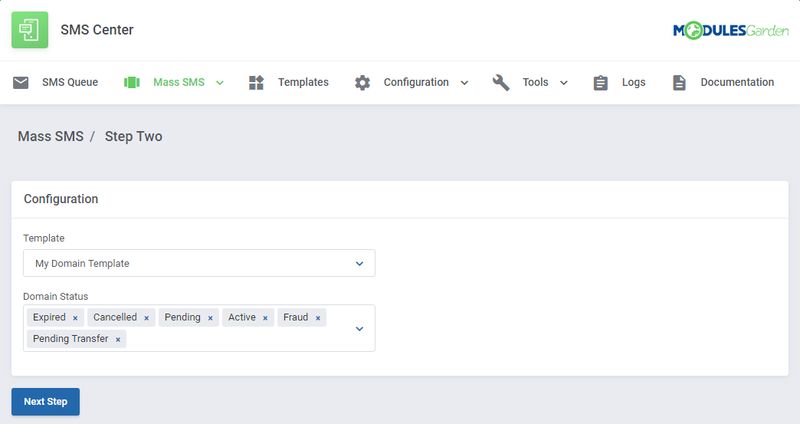 If you are using Client Profile Viewer For WHMCS integration, you will also need to update it to the version 1.5.8 or later. 2. 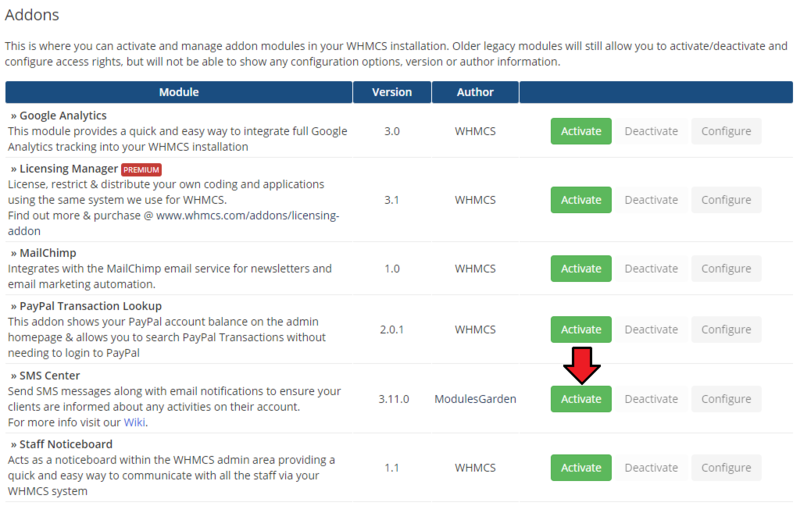 The module is currently not compatible with Multibrand For WHMCS or with Resellers Center For WHMCS functionality. Do not use this modules together. 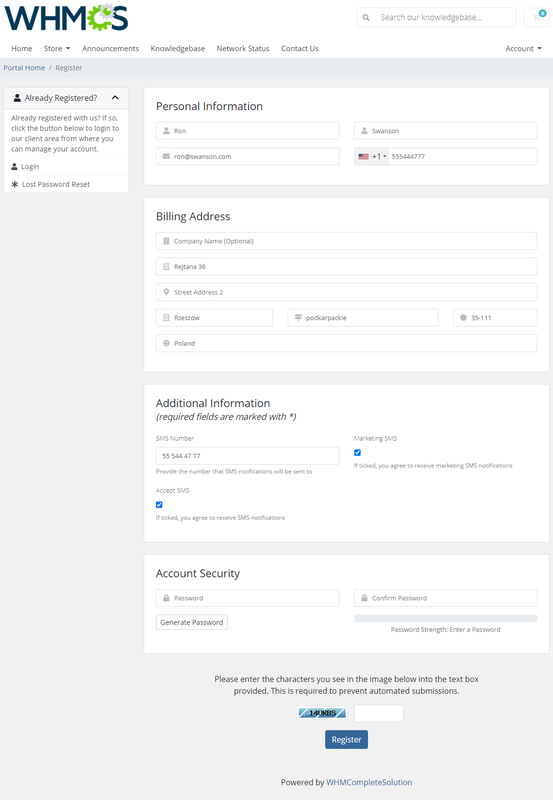 This page was last modified on 8 April 2019, at 10:29.